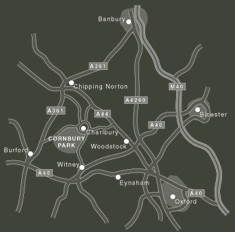 The earliest mention of Cornbury is in the Domesday book, where it was recorded as being adjacent to Wychwood Forest. The park became included in Wychwood Forest as royal property, and a Keeper, normally a royal favourite, was appointed. He was responsible for the provision of royal hunting facilities and the supply of venison to the royal kitchen. The earliest mention of a house in Cornbury Park is in the Close Rolls of 1337, when the Exchequer was ordered to pay for: "a stone wall about Cornbury Park, a post towards the King's forest there, a house called 'Logge' of stone and timber in that park, and a dike of wood forty feet broad by the circuit of the park, and two deer leaps in the park." 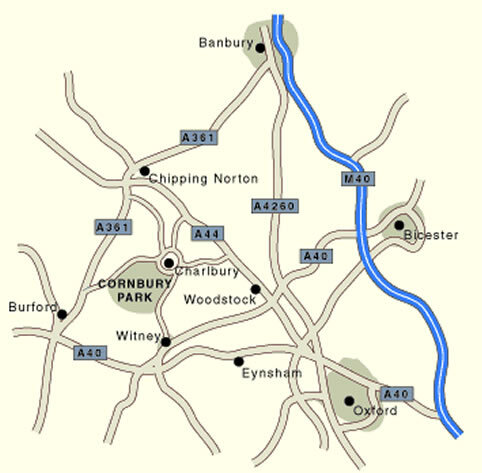 The status of royal property was maintained until 1642 when Charles I gave Cornbury Park to Henry Danvers "forever". Danvers, the Earl of Danby, had occupied the property since 1615 and had built a new house there in the 1630s (the present south wing). Danby was greatly interested in gardening and in 1622 donated five acres of land to the University of Oxford to be laid out as a physic garden. In 1661, Edward Hyde, 1st Earl of Clarendon, became the owner of Cornbury Park and immediately embarked on a programme of alterations, including additions to the house, the design of the chapel, and extensive landscaping, including planting nearly 2000 trees in a single year. In 1663 the large stable facing Charlbury was built, and in 1665 the south eastern wing of the house. He also created one of the first ha-ha walls in England, where a terrace wall kept out the deer, but allowed an uninterrupted view across the park. The 2nd Earl of Clarendon inherited Cornbury from his father in 1674, and continued the interest in landscaping developed by his father. He had a stone bridge built over the Evenlode to form a new approach to the house from the north east side; prior to this the avenues suggest that the main approach was from the north west. However, by the end of the seventeenth century, he had run into serious financial problems and resorted to farming part of the park. The deer were removed, a large number of the trees were cut down, whole areas ploughed and sown with clover, intended for arable crops, whilst other areas were grazed. However, in 1700, the park was sold to his brother, Laurence Hyde Earl of Rochester. During the late eighteenth and early nineteenth centuries, Cornbury Park was owned by the Duke of Marlborough and was re-named Blandford Park, although no grand scale alterations to the park were made during this period. Some Victorian additions were made to the house during the nineteenth century, but these were removed during further alterations in the early twentieth century, when there was also the construction of a stairway across the terrace wall into the park, elaborate extensions to the gardens, and new gate lodges and entrance gates. The present owner is The Lord Rotherwick.